At the core of next generation data centers are software defined data infrastructures that enable, protect, preserve and serve applications, data along with their resulting information services. Software defined data infrastructure core components include hardware, software servers and storage configured (defined) to provide various services enabling application Performance Availability Capacity and Economics (PACE). Just as there are different types of environments, applications along with workloads various options, technologies as well as techniques exist for virtual servers and storage. 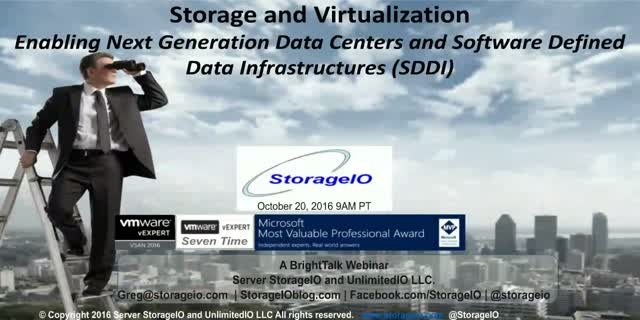 Join us in this session to discuss trends, technologies, tools, techniques and services around storage and virtualization for today, tomorrow, and in the years to come.